KATHMANDU, Nov 3: Number of vehicles has exceeded 1.1 million in Kathmandu which has thrown the Valley traffic management out of gear. 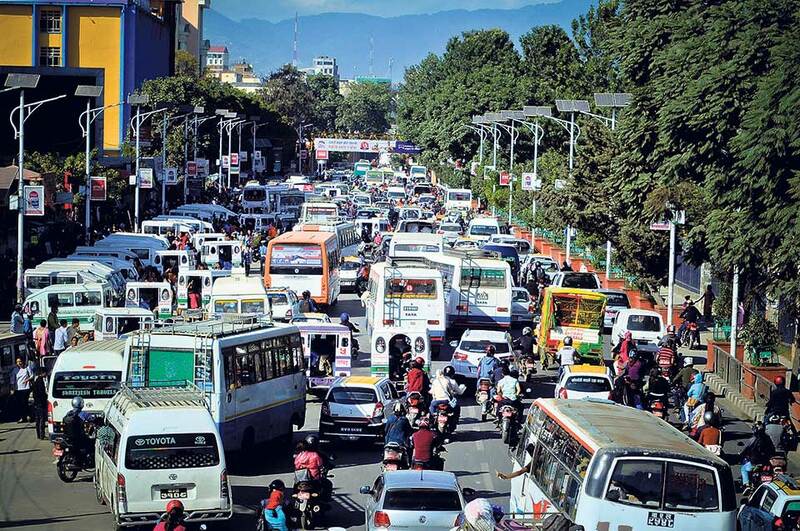 The traffic management has turned to be a daunting task due to inadequate traffic lights at thoroughfares and main roads and limited traffic human resource to manage traffic at the Kathmandu Metropolis, said senior traffic officials. Basanta Kumar Pant, Senior Superintendant of Police (SSP) of Metropolitan Traffic Police Division said the traffic management has become more challenging when the federal capital city also has to sustain pressure of over two million vehicles registered in other 13 zones of the country. According to the Traffic Division, roughly 3.23 million vehicles have been registered across the country in the fiscal year 2074/75. Among them, more than 1.17 million vehicles were registered in Bagmati zone alone. Around 36.4 percent of the total registered vehicles across the country play in Bagmati. SSP Panta shared around 97 percent of the vehicles registered in Bagmati zone are private. He added that the traffic management has witnessed more challenging while 90 percent of the vehicles registered in Bagmati are plying on the Valley roads. Among registered vehicles in Bagmati, more than 921,000 are motorbikes. Likewise, there are 48,242 registered bus and trucks, 13,553 power tillers and dozers, 142, 339 cars and jeeps and 6,330 tempo and microbus. The Traffic Division noted a huge influx of private vehicles of late, movement of vehicles from all 77 districts to Kathmandu and operation of vehicles registered outside in the Valley have increased woes to traffic management. Durbarmarg Traffic Police Sector In-charge Daya Krishna Bhatta argued that the traffic management in the Valley could be made further efficient by well equipping the traffic police as well as considering making the Valley’s road more infrastructure-friendly. To that end, he suggested that the concerned agencies need to place traffic lights adequately in the major junctions and the traffic signs need to be visibly installed. He was of the view that an effective and promote coordination among the concerned agencies such as the NEA, Department of Roads and Department of Sewerage among others could also largely contribute towards smooth and effective traffic management despite the current insufficient numbers of traffic police in the Valley. The Valley has 2014-KM of road (660 kilometers for one lane, 239 for two lanes and 193 for four lanes), according to data with the Department of Roads. Lack of human resources is also making the matter worse. A traffic police is assigned to manage an average of 841 vehicles, which is far from practice, said SSP Panta. A total of 1,400 traffic police are managing approximately 1 million vehicles plying in the valley on a daily basis. The police have stressed the need for technologically equipping the traffic management works for better results. Likewise, incorporating traffic education in school curriculum is also stressed. There is also a need to install CCTV cameras in the roads, launch digital recording system and build a traffic children park. The valley's roads are filled with potholes and cracks at many areas, and lack enough sidewalks for pedestrians. There lacks sufficient overhead bridges. Lack of traffic lights adds to traffic management problems, while unmanaged footpath vendors create hassles.